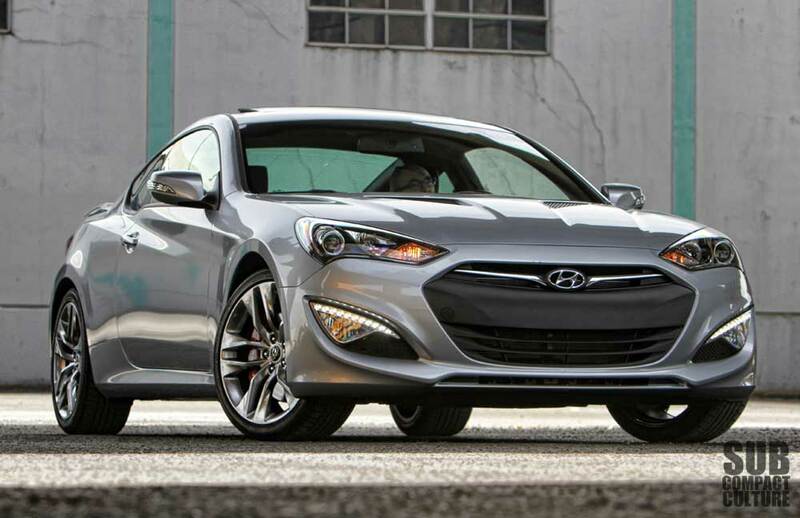 The 2013 Genesis Coupe gets an aggressive new front fascia. Our tester looked great in silver. Photo by Curtis Reesor. One of the fundamental thoughts behind Subcompact Culture is the idea that you don’t have to have a ton of power to have a ton of fun. I maintain that certain cars with 100 horsepower can be a hoot to drive, especially in the corners. 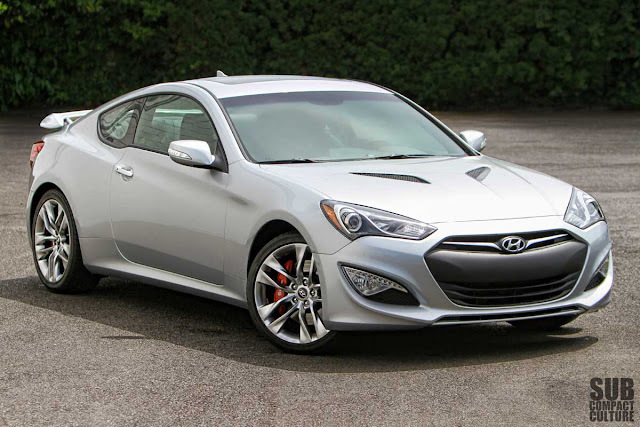 That being said, the 2013 Hyundai Genesis Coupe 3.8 Track has 348 horsepower put to the rear wheels. To say having 348 hp is “fun” is like saying that a wall of Marshall amplifiers at rock concert is “loud.” In fact, the Genesis Coupe 3.8 Track as a whole is a damn blast, and it’s amazing to think this greatness is coming from the same company that offered the Scoupe as its sportiest offering at one point. Remember that car? Don’t worry, you’re not alone. 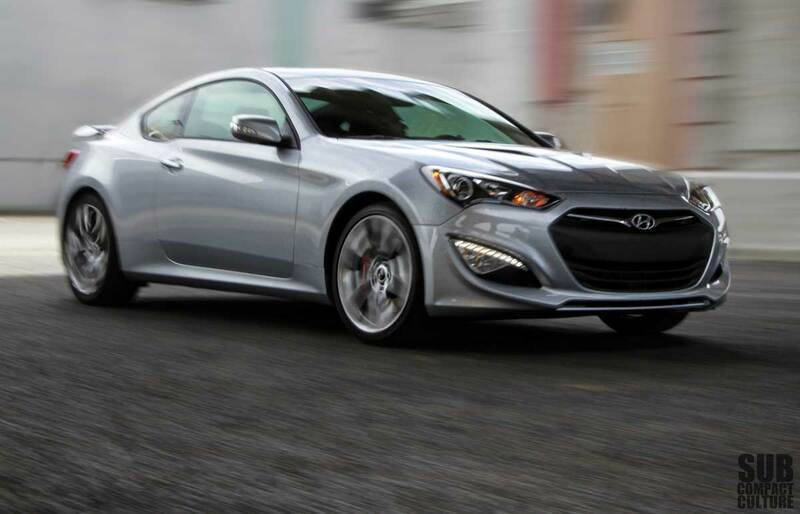 The Genesis Coupe is refreshed for ’13, sporting new front and rear fasciae and more power. In fact, power gets a significant 42 horsepower bump, and 29 more ft./lbs. or torque (348 and 295, respectively) on premium fuel. For you misers, you can use low-octane fuel, but performance will decrease. I’d advise sucking it up and giving it the good stuff. Great lines, a prominent grille, and new LED running lights round out the Genesis Coupe's front. Photo by Curtis Reesor. 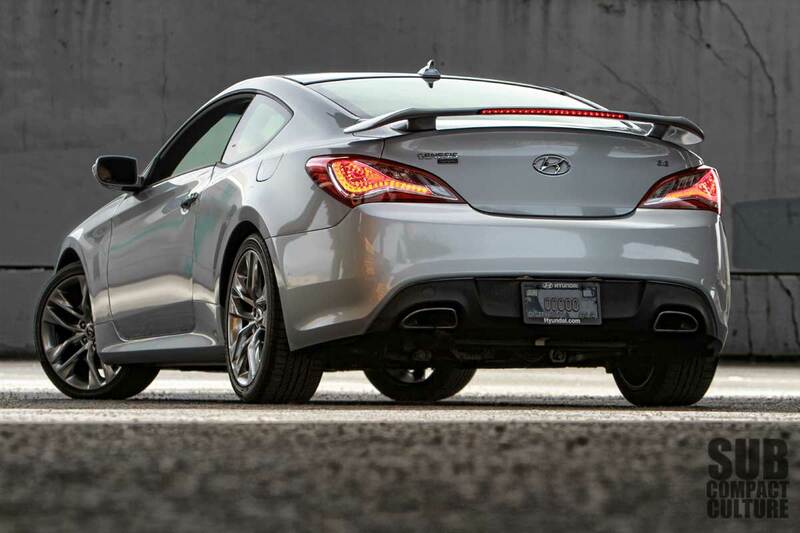 From the get-go, the Genesis Coupe is a looker. Its sweeping lines are clean, racy, and aggressive, and it looks like it has 348 horsepower. New for ’13 is the revised front end with black bumper insert, which I prefer compared to previous Genesis Coupe model. There are the attractive 19” wheels with big Brembo brakes tucked behind; the spoiler, which flow remarkably well with the car; and LED running lights up front. It runs the razor’s edge of being over styled, but it isn’t and hits the mark without looking like it’s “too much.” Nearly everyone I showed the car to thought it looked great, too. The interior is solid and comfortable. The three gauges on the center stack look impressive, but can be distracting. Slip inside the low-slung Genesis Coupe, and you’re greeted by high-quality running gear. The front leather seats are what you’d expect from a bona fide sports coupe. They’re supportive yet comfortable. One complaint: The headrests are canted forward a lot and can be uncomfortable. The car does have a 2+2-style back seat that’s best left for short trips, cargo, or for convincing your significant other that a car seat could fit back there. Visibility is unexpectedly good for a sports coupe. I thought it might be a touch difficult to see out of, but it wasn’t. The dashboard was met mostly with praise, as gauges were easy to read, radio/navigation and HVAC controls were intuitive to operate, and the steering-wheel-mounted controls work as they should. Hyundai’s BlueLink infotainment system offers a host of techie features, such as location sharing, voice text messaging, and roadside assistance. As with most Hyundais, the Bluetooth connectivity is some of the best and most intuitive in the automotive industry. As I told my co-worker: Forget that Hyundai ever made the Excel. Forget about all the things you have in your head about Hyundais. This car is 100% proof that Hyundai is making world-class cars that are solid, attractive, reliable, and worth owning. Don’t believe me? Live with this car for a week, and I dare you to come back and tell me it’s junk. You won’t. Now can someone help me off this box of soap? Back to reality, but only for a moment. Because push the start/stop button on the dashboard, and the 3.8-liter gasoline-direct-injected V-6 will roar to life with an ear-pleasing symphony of power that may make your forget about your troubles all together. Our test model included Hyundai’s new eight-speed automatic transmission—yes, eight forward gears. And although I was hoping for the six-speed manual model, the automatic is quite good, so long as you leave it in the automatic mode. Shifts are smooth and quick. Unfortunately, if you opt to shift the gears with the steering wheel paddles or move the gear selector on the stick, things don’t happen quickly enough to be used spiritedly. There’s too much delay to truly take advantage of vigorous driving if you shift things yourself, which is a shame, since so much is good about the driveline. The software just can’t seem to keep up. However, put things in “D,” mash the throttle, and you can’t help but grin as there is gobs of thrust; plus there’s that racy exhaust note. It’s not quite as loud as a Nissan 370Z, but it’s along those lines. Grip is tenacious with its 225/40/19 front tires and 245/40/19 rear tires, however, you can make the rear step out when pushed, but it’s quite predictable. The traction/stability control quells most of the tire spin and horizontal escapades; perhaps too much so at times. Luckily for you track rats, the traction control can be disabled. Handling is very good; the ride is understandably stuff, and the limited-slip differential does a great job of keeping things in check. Even in the rain, the Genesis Coupe had impressive grip with the Bridgestone Potenza tires. 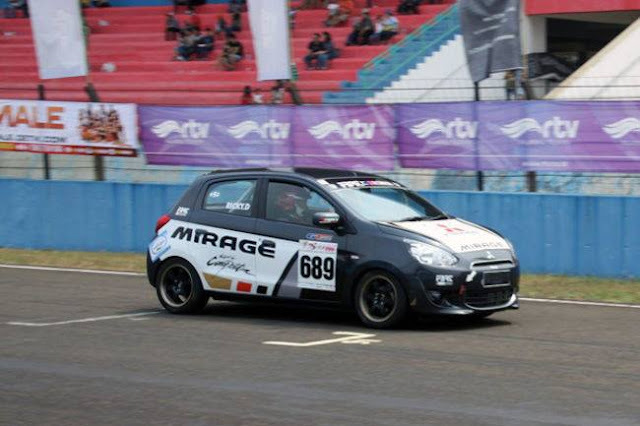 Cornering is as flat, turn in is quick, and the steering is precise. This coupe is no lightweight, by the way. The curb weight for the auto-equipped Genesis Coupe is 3,613 lbs., which is right in line with both the Ford Mustang and Chevy Camaro V6 models, but heavier than the 370Z. 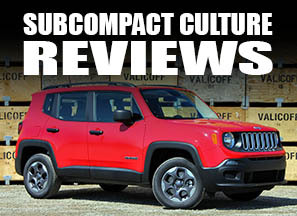 Performance wise, it is very solid—even with the automatic. You’re not buying this car for its fuel economy, but it is rated at 18 city and 27 highway on premium fuel. We got 19 MPG. A quick shout out to those big Brembo rakes, too. They saved my bacon in one instance where a inattentive motorist pulled right out in front of me while I was doing 50 MPH. These suckers really grab. This V-6-powered Hyundai Coupe will do battle against other rear-drive sixes, such as the turbocharged Ford Mustang, the Chevy Camaro, and the Nissan 370Z. At about $35,000 as tested, it’s more expensive than a similarly equipped Camaro and Mustang, but less than a 370Z. And yes, it still has Hyundai’s 5 year, 60,000 mile bumper-to-bumper warranty and 10 year, 100,000 powertrain coverage. With an attractive back side, great stance, and solid lines, the Genesis Coupe is a real looker. Photo by Curtis Reesor. More than anything, this car shows that Hyundai can play in the sports car big leagues. It is not a second-rate choice, and it should be on shoppers’ lists if looking at the above-mentioned RWD cars. Oh, and by the way, it’s technically a subcompact due to its interior volume. So yes, I’d say this is a subcompact car I could definitely live with. I still maintain a 100 hp car can be a lot of fun. But the Genesis Coupe with its 348 hp is a freakin’ blast. Hyundai has a come a long way in a very short amount of time. I still remember the ads when they first appeared in the United States (1986). It soon became apparent why you could buy 2 Hyundai's for the price of one car. Haha! Fast forward to the later '90s. Although they weren't that great looking or fun, the reliability was getting better. Fast forward to now & just about everyone & their grandma is rocking a Hyundai. Quality & reliability is pretty much dead on or even exceeding the Japanese. But yeah! I'd rock the Genesis coupe if I had the money. I'm a big fan of Hyundai and I really like the Genesis Coupe. I would personally prefer the turbo-4 with a manual transmission, but it's nice to hear that the V6 model has stepped up to a nice level of power that almost substitutes for a proper V8. I bought the "Track" edition and love it. I would have never dreamed of owning a Hyundai but after I took I test drive..its all history.